Elixir of the Undead Zombie Wine Holder Figurine FTH1962 Description This zombie is on it's back holding a wine bottle or any other comparable bottle. 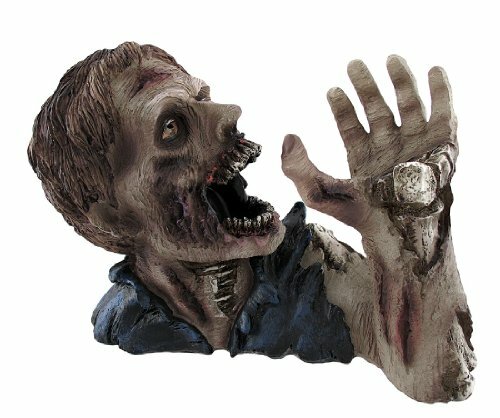 The bottle top fits perfectly in the mouth of the zombie. The bottom of the bottle fits on the top of the zombie hands. Hand painted and crafted by professional artists to present life like character. Made of resin. Colors may vary slightly. Bottle not included. Approx 8H x 12W x 6D Attention International BuyersPlease allow two to six weeks for your order to arrive due to varying times through your countrys customs. Also please note that items can not be tracked while in your countrys customs. Buyers are responsible for any additional cost due to the destination countries tariffs, taxes or postal system. International Buyers Please Note: Import duties, taxes, and charges are not included in the item price or shipping cost. These charges are the buyer's responsibility. Please check with your country's customs office to determine what these additional costs will be prior to bidding or buying. , In original container. Ships from our location in Utah within 1 work day.